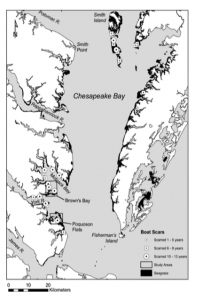 Image of the study area in the Lower Chesapeake Bay. Photo credit Orth, Lefcheck and Wilcox. 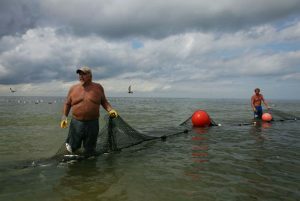 A study recently published by Robert Orth, Jonathan Lefcheck, and David Wilcox of the college of William and Mary, examined the impacts of boat propellers and fishing gear on seagrass in the lower Chesapeake Bay. Seagrasses are important as many targeted fish depend on seagrass as some point in their life for food and habitat. The Chesapeake Bay itself has historically supported a large abundance of seagrass beds. Today, the remaining seagrass beds support a variety of commercial and recreational uses. The study used 26 years of aerial imagery and three years of ground surveys to explore the degree of impact from fishing gear, and the distribution and recovery of the scarring of seagrass beds. 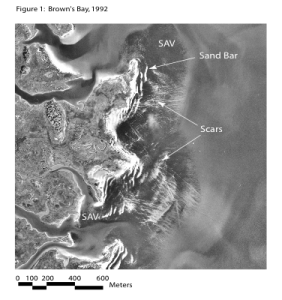 The aerial photography has been a project of the Virginia Institute of Marine Science since 1987. The study took place on the Bay’s western shore from Smith point Southward, including the James River and the eastern shore from Fisherman’s Island north to Smith Island. The authors were interested in discovering why seagrass growth was so rapid in certain areas. They were also interested in resolving conflict between different user groups such as scientists, managers, and recreational fishermen. Aerial image used in the study. Photo credit: Robert Orth. The study found that the damage to seagrass was the most extensive on the western shore of the Bay, where pressure from haul seining was more intense. The aerial study from the preceding 26 year period showed scars with an average length of 78.5 +/- 1.5 m. The three year study revealed a total of 47 beds along the eastern and western shore were scarred, generally oriented perpendicular to the shore with an average of 2.8 +/- .1m. However, an individual observed scar generally only lasted for an average of 2.7 years. The location of the scars suggests that there were two primary activities that cause scarring: crab scraping along the eastern shore, which entails pulling a 1.5 m wide metal basket through seagrass for molting blue crabs, and hauling seine nets for fishes along the western shores. Additionally, quick actions by regulatory agencies in identifying damaged areas can lead to swift recovery and effective conservation of underwater grasses. Image of haul seining on the Chesapeake Bay. Photo credit: Virginia Pilot. Interestingly, recreational activities were determined not to be a primary source of damage for several reasons: (1) Sandy beaches are not typically located near seagrass beds and (2) most water skiing and boating occurs in deeper waters. Furthermore, most private and public piers extend into deep areas or navigational channels. One exception to this rule is in areas where boaters may become stranded on exposed seagrass shoals such as Texas and Florida. hauls) and number of vessels (decreased). The new regulations yielded a 90% reduction in the frequency of new scars within on year in Brown’s Bay, and 43% reduction on Poquoson Flats on the Eastern Shore. Aerial studies from 2003 to 2015 revealed highly reduced scarring, suggesting that the regulations were effective. Seagrass beds on the Chesapeake Bay. Photo Credit: Virginia Institute of Marine Science. As part of this study, the authors will continue to conduct annual surveys for the Virginia Marine Resources Commission, with no end date in sight. In the future, the findings of this ongoing study may have significant implications for future management decisions regarding seagrass beds in other areas of the country, and should be closely monitored as part of the regulatory process. Orth, R. J., Lefcheck, J. S., & Wilcox, D. J. (2017). Boat Propeller Scarring of Seagrass Beds in Lower Chesapeake Bay, USA: Patterns, Causes, Recovery, and Management. Estuaries and Coasts, 1-11. Previous story Do alluvial islands hold the key to sturgeon habitat restoration?